Oceanfront One Bedroom Condo Boardwalk 1030! 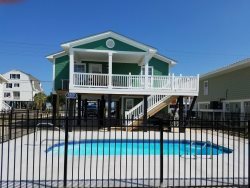 3 Bedroom, 2 Bath beach house! This condo has one bedroom, TWO full baths and TWO private balconies! It's located in the heart of Myrtle Beach, SC at Boardwalk Beach Resort! So close to many famous attractions such as Broadway at the Beach and the Myrtle Beach Convention Center! The master bedroom features 2 full size beds, a private full bathroom and a private balcony with stunning views of the Atlantic ocean. This condo can sleep a total of 8 guests! The living area has a full size murphy bed and a full size sleeper sofa. The 2nd full bath is located in the hallway of the unit and offers a jetted tub! Pack light as this condo has a full kitchen with all cooking supplies, dishes, silverware you need! Each bath is stocked with 8 bath towels and 8 washcloths and toiletries for your stay. The fitness center and laundry room as located in adjacent buildings and are not accessible to our guests.